24/01/2018: Still at Lvl. 4 (AWAS). No change for the last five weeks to report. The volcano is still very restless. Occasional ashy bursts, some glow at nights and strombolian fountaining has been observed. In the rainy weather there is a great danger of lahars (or “cold lava”) racing down the streams and valleys, beware! 08/12/2017: Still at Lvl. 4 (AWAS). After a week without ash clouds G. Agung began emitting ash again today. There is no continuous eruption but occasional bursts, up to 2100 m high, with *relatively* little ash. 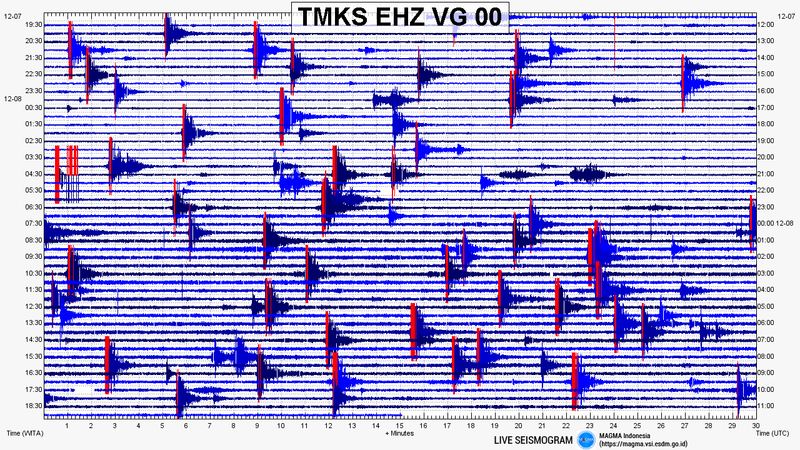 During the last two days many small earthquakes on the seismogram (volcano-tectonic, low-frequency & continuous tremor) indicate that more magma is on the move and the volcano remains restless (see latest report). Airports operating normally. 05/12/2017: Status: AWAS. During the last few days seemingly quiet, but w/ higher amount of VT earthquakes, G. Agung has been quite restless internally. Today we see a bout of continuous tremor again. 27/11/2017, 06:00 WITA: Alert status for G. Agung has been raised to level 4 (AWAS, RED). Danger zone: radius of 8 km from the crater and a sectoral expansion to the North-Northeast and Southeast-South-Southwest of 10 km from the crater. People within the danger zone are urged to immediately evacuate. Bali Int’l. airport in Denpasar closed from 27/11/2017, 07:00 up to 28/11/2017, 07:00, or according to further evaluation. It has been found that the eruption is now of a magmatic nature. Ash is emitted continuously to heights of 2,000-3,400 m from the peak, with ash puffs sometimes accompanied by explosion sounds heard up to 12 km away. At night a strong glow can be seen from the crater. Non continuous harmonic tremor was recorded w/ amplitudes of 1-10 mm (dominant 1-2 mm). 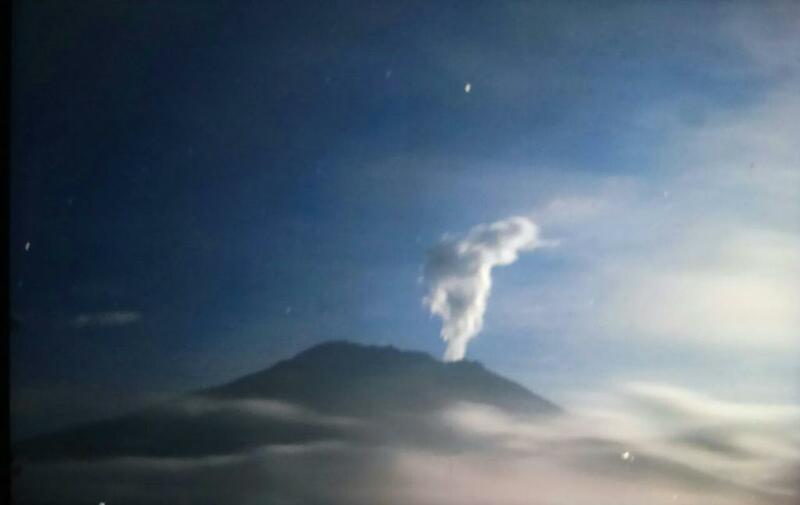 25/11/2017: This morning, Bali woke up to some more energetic eruptions. Agung Aviation Code has been raised to Red. Last ash column reached 6142 m a.s.l. (3000 m above crater). Volcano alert level unchanged at 3 (Siaga, or orange). 25/11/2017, 17:30 WIB: G. Agung had another blast today, ash column up to 1,500 m (from the crater). Still Lvl. 3 alert. Some flights diverted, but Bali airport still open. Ash emissions are continuing, also some incandescence could be seen at the Bukit Asah webcam. No panic among people, but many have resumed self-evacuation. 21/11/2017 17:05 WIB: Finally, a small eruption happened today in G. Agung, Bali. The eruption was initiated by a low-frequency tremor. A medium pressure plume with a thick gray color rose about 700 m above peak (https://magma.vsi.esdm.go.id/press/view.php?id=111). LF tremor on the seismogram and ash emissions were observed for several hours afterwards. Seismic unrest decreased over the following few hours. Status unchanged, Lvl 3, 6/7.5 km radius. For images and further updates also check @id_magma on Twitter (https://twitter.com/id_magma). The status was changed on the grounds of declining seismic activity. Even though inflation is not declining, it is not rising either. So, it is still anyone’s guess where developments go from here. 21/10/2017: No eruption yet. Even the rough Ggl-translation makes it clear that there must have been a harsh discussion in Bali over the alert status of G. Agung. Mr. Kasbani (PVMBG/ESDM) confirmed that the status of Gunung Agung remains at Level IV (Awas). Although seismicity has decreased for the moment it is still high and fluctuating. Moreover, the mountain is still inflating, i.e. magma and gases are still rising within. He said this is definitely not the time to lower the status of the volcano. Left: GEarth image of Agung crater from 03/08/2014. Right: One of the first 400 images of drone flights over crater on 10/19/2017. The crack in the E part (left side) reportedly widened. – Click to enlarge! Both images enhanced (for sharpness,/contrast) by me. To be honest, I can’t spot the cracks… Click! The PVMBG report of today shows the fluctuation of EQ activity in a presently smaller number of events. 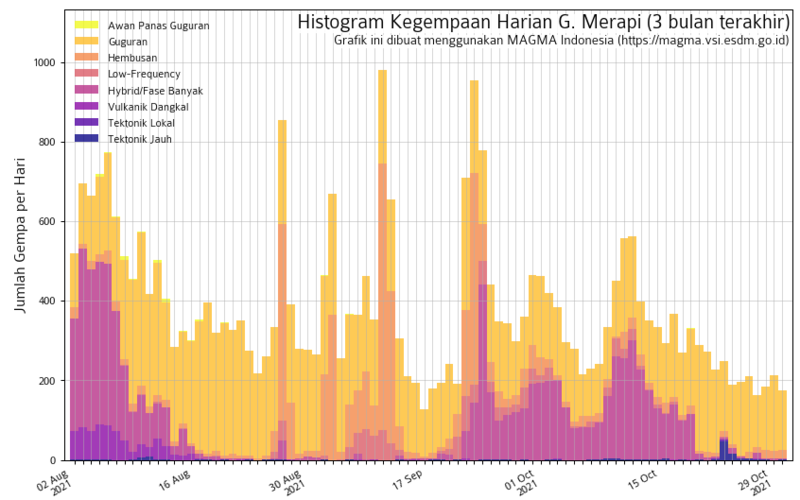 Overall EQ activity from 15/09/207 up to date (via BNPB on Twitter) Click! The Bali Expat reports that today a decision was expected on whether or not to downgrade the alert level from 4 to 3, based on declining seismicity. Yet, no announcement has come through in the media so far, and it’s past midnight in ID now. This is a very hard decision to make, perhaps they are still sitting over it. 2017-10-07 20.30 LT: No eruption yet. Higher steam plume (1,500 m) from the crater today though. Earthquake activity still at the same high level, even though the seismogram showing the quakes being somewhat smaller today. Steam release might have taken some of the internal pressure off. – seismic activity at the volcano still represents the brittle failure of rock inside the volcano in response to magmatic intrusion. – water expulsion in the crater near the solfatara field has been observed by satellite. This is thought to reflect a disturbance to the hydrologic system in response to intruded magma at depth. – the mountain until today (except for one day) showed continued inflation. – SO2 emissions have not been detected. But the gas could still be there, dissolved in the hydrothermal system. – Visible emissions from the crater consist of 50-200 m plumes of water vapor (or maybe steam, but not smoke). 2017-10-03: No eruption yet. Seismicity somewhat intensified. Otherwise not much has changed. 2017-09-26 00.40 UTC: So far, Mount Agung has not erupted. – Report – The update of today says that still increasing seismicity indicates magma rising to the surface. Gunung Agung is currently entering a critical phase. [It remains to be seen] if there is enough power for a big push and if it will be able to break down the lava plugs in an eruption. The number of refugees until Tuesday morning (26/9/2017) is 57,428 people, i.e. almost all who live in the danger zone. 2017-09-22 20.30 local time: The alert level for G. Agung has just been raised to 4/4 “AWAS” (“Danger!”) Report Access restriction is in place for a radius of 9 km around the volcano, extending to 12 km in the N, SE and SSW. – Dr. Janine Krippner: accurate daily infos in Engl.